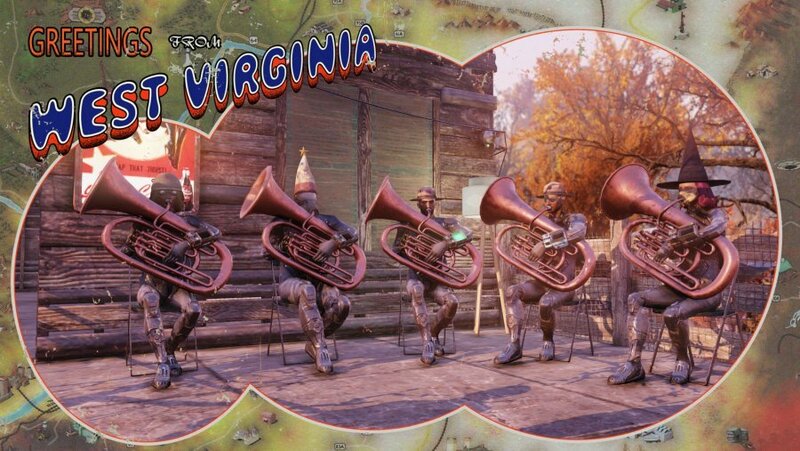 These Fallout 76 players created their own fun with The Order of the Tuba. Despite the many issues Fallout 76 players have with the game (and rightly so), it seems there are people out there who actually are having a good time with it, against all odds. Meet the Order of the Tuba, a group of Fallout 76 players brought together by something as simple as walking around with the large musical instrument. Except this isn't Baman Piderman, where Tuba is sentient. These are just your regular, run-of-the-mill tubas. Post-apocalyptic, natch, but still tubas. One day, apparently Twitter user @Goobers515 set out to form the new family, "The Order of the Tuba" in-game, and sent out the call for other tuba-toters to join in. Referring to the instrument as "The Great Sky Horn," it looked like their mission was simply to walk around carrying the instruments and perhaps being a little obnoxious (the jury's still out on that part, of course). Tonight's stream was a JOURNEY of a kind that I've never had before. This was our humble begins. The group marched around trying to "turn" their enemies to the "light" of the almighty tuba, and they in turn helped "convince" others to join the order. They continued to open up additional "locations" throughout the game, including additional "sanctuaries" throughout the West Virginia wasteland. It's all quite silly, but the Order of the Tuba made for a fun Twitter thread illustrated via images from the game. "Bethesda opted to release Fallout 76 in a broken state, and this time I’m not laughing along about the bugs simply because we’ve come to accept them as a part of the Fallout franchise. How does Fallout 4 look infinitely better than Fallout 76, with the former coming out in 2015, more than three years ago? Fallout 76 is a decent game, but all the good is being crushed by the plethora of problems that just shouldn’t be problems."